This is the first game in the Defender of the Crown series. 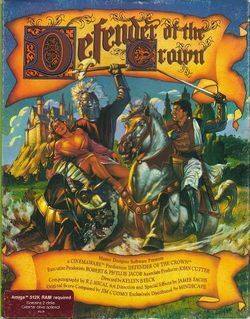 For other games in the series see the Defender of the Crown category. Defender of the Crown is a turn-based strategy game set during a 1199 civil war between Saxons and Normans, and was released in 1986. In the following year, it was updated and ported to Apple IIGS, Atari ST, Commodore 64, MS-DOS, NES and Sinclair ZX Spectrum. After the King returns from the Holy Land, he bestows knighthood over six warriors that assisted him during the Crusade; three Saxons and three Normans. When one of the Saxon knights meets with Robin of Locksley, he learns of the assassination of the King, which will lead the country into a civil war as the two nationalities accuse each other of stealing the crown. This page was last edited on 29 May 2016, at 18:23.